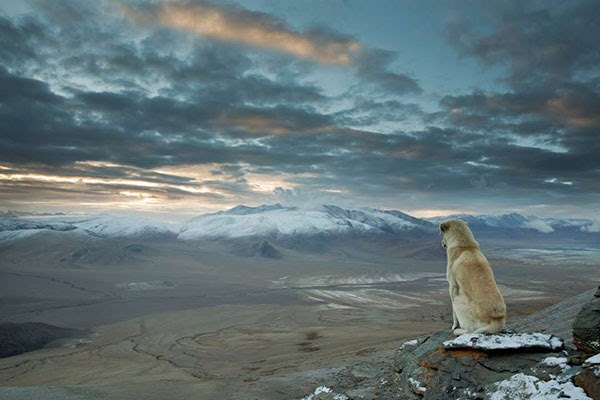 Beautiful shot of a dog staring at the barren landscape of the Himalayan outback. This dog just appeared out of nowhere and followed us for an entire week during our trekking trip in the Himalayan outback. He always used to sleep in front of our tent and guarded us in the nights. When I decided to get up at 4 a.m. to climb the next 5000 m peak for sunrise he accompanied me as well. On the top he was sitting for the entire 30 minutes on this place looking straight into the countryside. I'm normally quite reserved towards dogs, but this one became a real friend to me.